Stadio Comunale Sant’Elia is the traditional home ground of Cagliari Calcio however the club have temporarily left the stadium in recent seasons due to growing safety concerns. First opening in 1970, it is capable of seating 16,000 and was renovated for the 1990 World Cup. The Comunale stadium in Cagliari was built following the club’s first and only scudetto during the 1969-1970 season. Pipping Inter Milan to the title by four points, the new stadium essentially doubled the capacity of the old Stadio Amsicora and even managed to attract a 70,000 strong crowd for a match against Saint Etienne. Chosen as one of the twelve venues of the 1990 World Cup, Stadio Sant ‘Elia underwent large-scale reconstruction in order to prepare it for the global tournament, resulting more or less in today’s current form. Hosting three Group F matches featuring England against Netherlands, Egypt and Republic of Ireland, many rumours suggested that the ground was chosen to minimise hooliganism. England supporters were somewhat demonised after the events of Hillsborough and the Heysel Disaster. Reduced to a capacity of 39,905 for Italia 90, the number of seats was once again reduced in 2002 when Sant’Elia underwent significant reconstruction once again. Essentially reducing the capacity to slightly more than half, a new stand was built over the athletics track to create a more intimate footballing experience but it attracted criticism from certain sections of Cagliari’s fanbase who believed the plans weren’t ambitious enough. At the time former owner and now Leeds United Chairman Massimo Cellino unveiled plans for a new 25,000 capacity stadium in September 2007 however he was unable to agree planning permission with the local council despite pledging to privately fund the project. Creating a friction between the council and Cagliari the club opted to vacate Stadio’Elia during the final weeks of the 2011-2012 season. The club played their final league games at Trieste’s Stadio Nereo Rocco, and for the 2012-2013 season moved into Stadio Comunale Is Arenas. Largely a temporary structure, the move to the new facilities has proved disastrous after allegations of local corruption and lack of safety, and by the end of the 2013/2014 season Cagliari moved back into their old ground. The two stakeholders are now planning to work together to renovate the iconic stadium. Cagliari are one of the smaller teams in Italy with their biggest triumph coming in 1970 when they were able to win their one and only Scudetto with the help of Gigi Riva who to this days holds Italy’s all time goalscoring record. On the European stage their crowning achievement is a semi final loss to Inter Milan in the 1993-1994 UEFA Cup, with the club’s main objective these days being achieving permanent residency in Serie A. The best time to watch Cagliari is arguably against Palermo in what some call the Derby Delle Isole, “Derby of the Islands” which is a battle for Football supremacy between Sicilia and Sardegna. A cross section of the Cagliari Ultras. Away fans were traditionally housed within one section of the lower-tier in the main grandstand which runs for the length of the pitch on the western side. 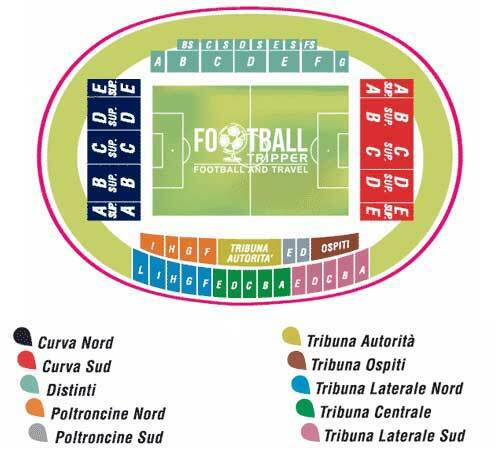 The “Ospiti” section was usually located next to Curva Sud as per the seating plan above. Located less than 50 minutes away from the train station and Cagliari city centre, the area immediately surrounding Stadio Sant’Elia isn’t the best for drinking at with the bulk of pubs are to be found back towards the Marina as per the map below. There aren’t many options around the stadium compared to other Italian grounds with the surrounding area largely belonging to residential housing and undeveloped wasteland. Inside the stadium the choices are also limited with it being advisable that you grab something to eat either at your hotel or around the city centre. As a city near the coast, Seafood forms a large part of the Sardinian cuisine with Scampi,l Rock Lobster and Bottarga being popular dishes. You might also be interested to know that the Island is famous for having the highest beer consumption per capita across Italy, with 60 litres per person which is essentially double the national average. Cagliari FC appear to operate two club shops throughout the city in addition to their own official online store. Known as Cagliari Points, one is located at 15 avenue la Playa, and the other is on Piazza L’Unione Sarda. An entrance sign for the stadium with ticket information and next opponent. Perhaps rather surprisingly Cagliari actually offer fans the chance to undertake a tour of the facilities at Stadio Sant’Elia. Fully-guided, the tour is a great experience for any fan or tourist interested in the history of Calcio, and takes in usually restricted areas such as the hospitality section and pitch side. Tickets to see Cagliari in action can be purchased online, at the box office outside the Curva Nord or from one of the aforementioned club shops around the island. Please note that the above prices are taken from the match against SCC Napoli and may vary depending on who the opponent is. Please note that there is also a surcharge of €2.00 for all tickets purchased on the day of the match. Stadio Sant’Elia is located approximately 4km south-east of the heart of Cagliari, overlooking the main harbour of the city. It’s accessible from the Marina by following Viale Cristoforo Colombo along the coast. There’s a good number of car-park spaces available at the stadium which is one of the good legacies of Italia 90! As an island Sardinia lacks rail services to the rest of Italy but does have reasonable amount of railway tracks to take you around the region. Cagliari Elmas Airport is the international airport of the city and Island of Sardinia located towards the West of the club’s city and stadium. Expanded in 2003 with the addition of an extra terminal, the airport handles just under 4,000,000 passengers a year and is served by British Airways, Ryanair and easyJet in the UK. To get to the city centre from the airport you can catch a train for 1.25 euro and it will take you 5-7 minutes, with a frequency of 20 minutes between 5am and just after 9pm. Whilst there are a few hotels five minutes north of Stadio Sant’Elia, you’re much better off looking back towards the main Marina. Although slightly more expensive you’ll have a much better trip. Reasonably priced options include Hotel Italia, Affittacamere B&B and Hotel 4 Mori.